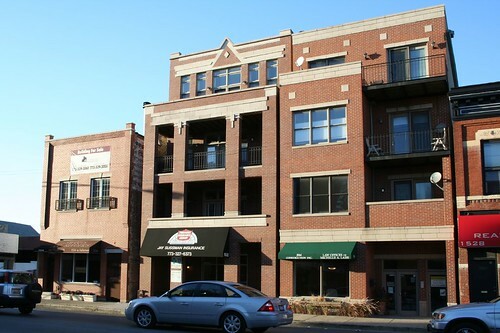 There’s often a lot of groaning and moaning about new construction in the city. Pretty much anything that gets built has someone that hates it. 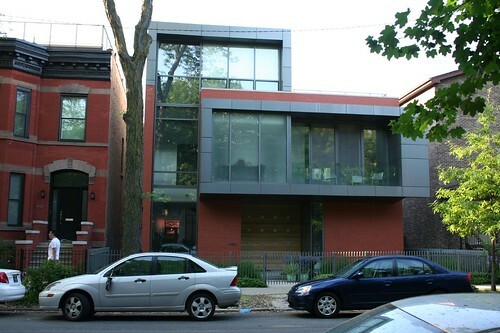 Contemporary design gets decried as “awful glass boxes” or “metal and glass monstrosities” (just try Google-searching either phrase.) 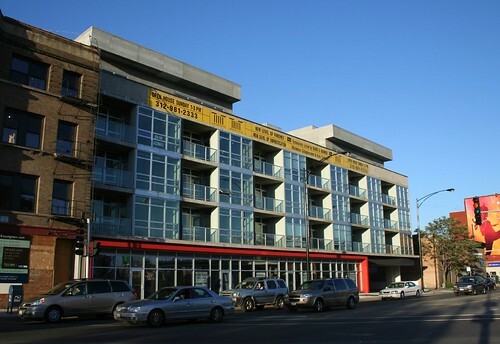 Sometimes the criticism has real merit, but I’ve heard such slurs used against buildings that I thought were excellent. 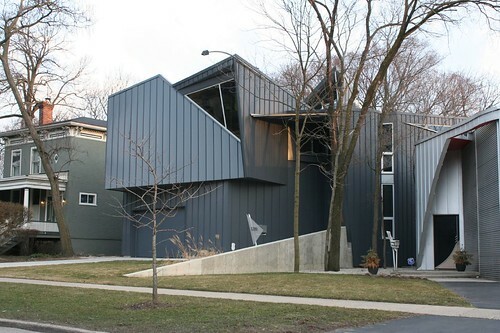 Meanwhile, this stuff is what you get when you don’t encourage contemporary modernism. 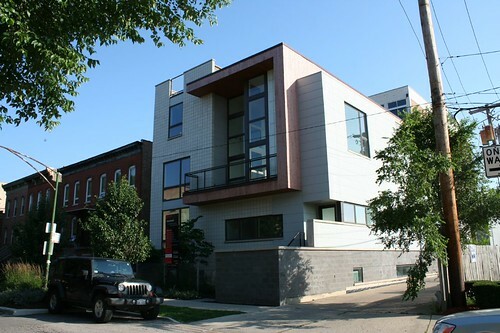 Faux-historicism is rightly denigrated by architectural purists as “watered down” and wishy-washy – even the ardent opponents of glass-box design must realize that there’s something unsatisfying about a brick-skinned condo with a few quoins and keystones tacked on. 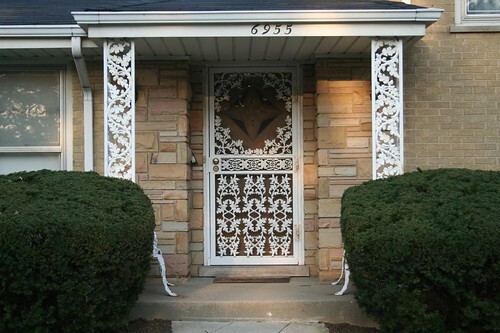 Consider the two designs above – interesting facade compositions, and wonderful recessed porches, but what’s up with the random bits of stone? 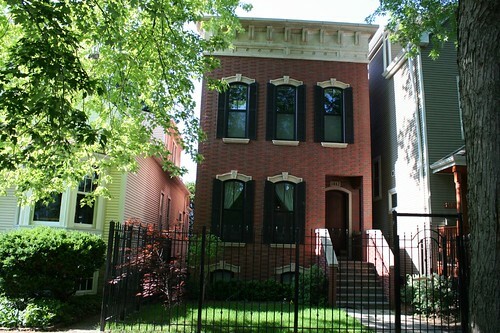 Is it supposed to be a Pullman row house? 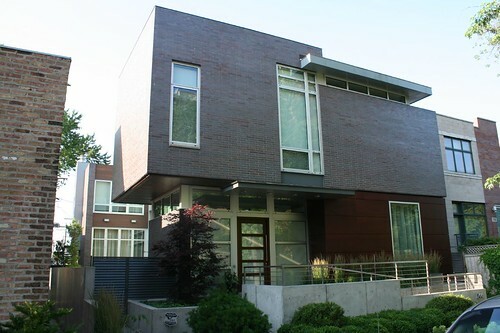 Are we meant to take the square columns and thinly banded stone as a contemporary Prairie style? Why the red brick? Is there any actual history of this area using red brick for… well… anything? 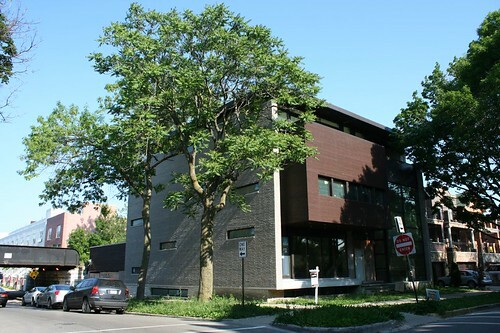 To do historicism right takes money and it takes serious architectural intention, neither of which are high on the priority list of your typical city developer. And even if you get it right, you’re left with an anomaly, a building out of time, a testimony that we live in a era that has failed to produce a great architectural style of its own. 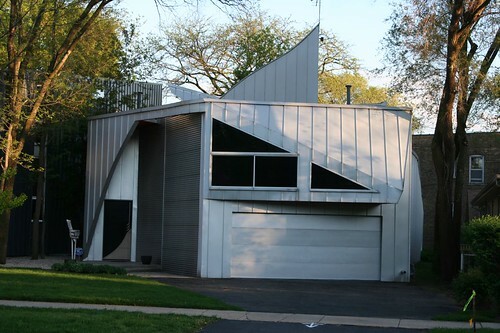 So, let us celebrate those fleeting moments when the architectural spirit does prevail. 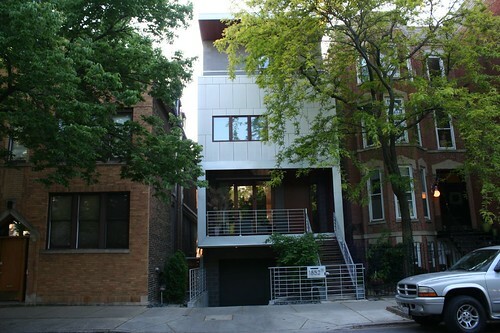 Chicago is dotted with infill houses in the truly contemporary style, where buildings become grids, and the grids are then pulled apart, cut open, sliced, diced, turned, flipped, snipped, slipped and zipped. 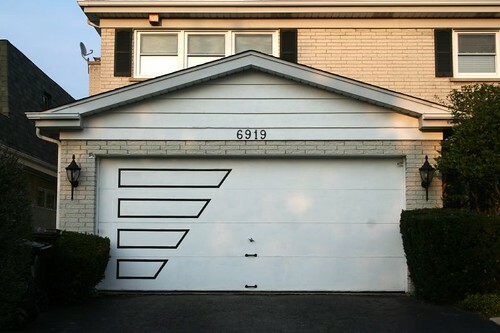 This is architectural play – contemporary architectural design at its best. It takes a committed designer to do it well. Chicago is lucky to have so many excellent examples. 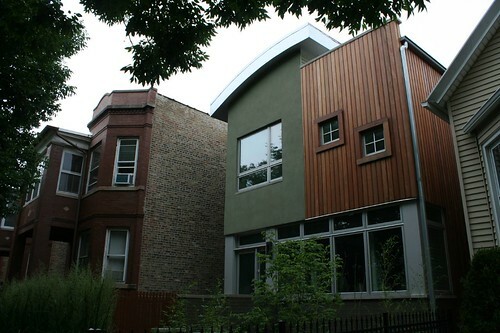 On the bottom, a classic Chicago house, deconstructed. On the top, a Frank Ghery Lite composition. 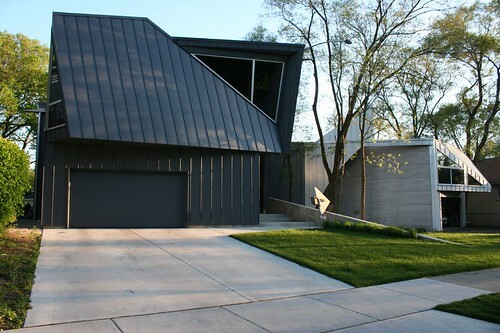 The classic contemporary modern infill home – a flat front facade seems to have slipped loose from its moorings, leaving an open strip of shadow. This move generates a bit of mystery – what’s inside that shadow? What materials are beyond there? Can you occupy that space? 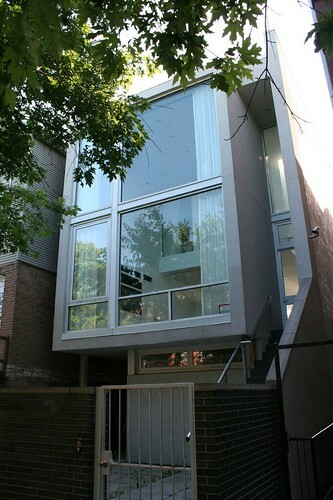 At a glance, a “glass box” – oh, the horror! But just look at how space flows through it. The bedroom is a box within a box, suspended over the living room with its own windows looking out onto the double-height living space that faces the street – and its own curtains to provide privacy when desired. On the right, the staircase seems to rise forever. 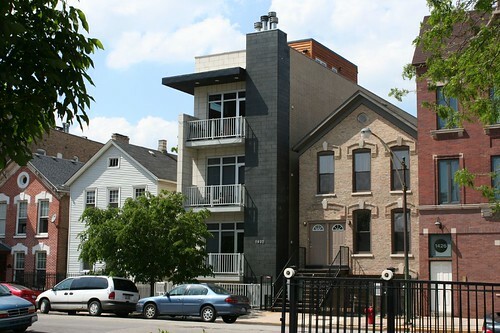 Two floating planes and a solid chimney tower make a plan block box into an engaging composition. Thickened wall planes have become one of the architect’s most potent weapons. Somewhere along the line, architects seem to have gotten over their obsession with making walls thinner and thinner… thus liberating them to make the wall into an actual object, or a thing with physical substance – something to contrast with all that glassy openness. 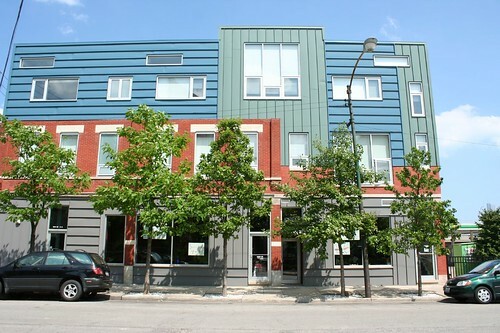 Likewise, the construction of a building as a series of overlapping shapes – interconnected boxes clad in different materials – has become a common form of architectural play. I’m not normally a big fan of standing seam metal panel as a cladding material. Usually it looks cheap and ugly. Architects give it way too much credit in general; when it’s hailed as a material of the future, I find the future to seem very bleak indeed. 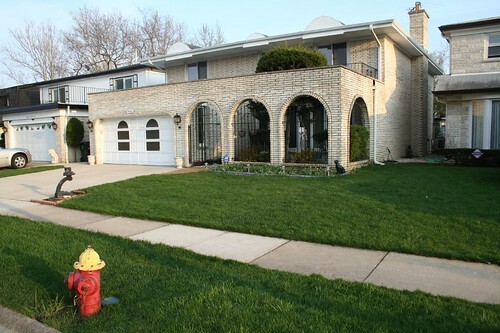 Here, however, it’s brought vividly to life with color, contrasting delightfully with the red brick. Another clever move is changing the directions of the seams to match the colors and harmonize with the window orientation. 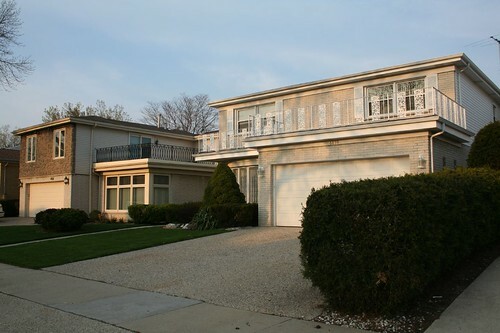 Here’s a pair of show-stopper houses up in Evanston, at 1216 and 1220 Main Street. 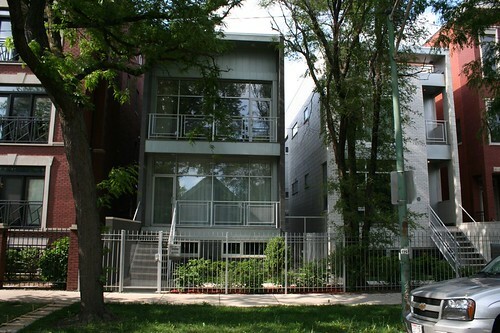 On the right: MetalHOUSE(1), developed by architect Andrew J. Spitz as his own house in 1985. 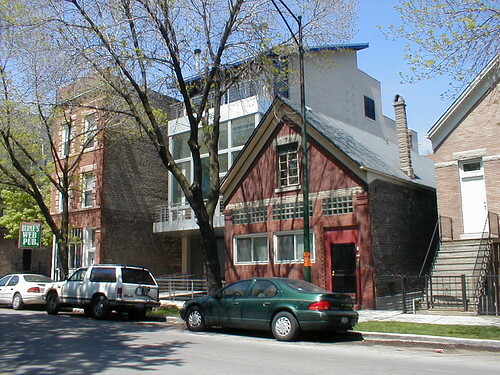 On the left: MetalHOUSE(2), a recently-constructed successor. 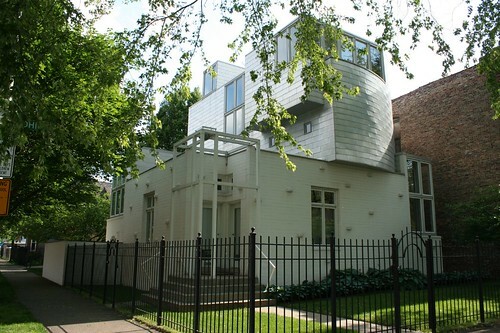 The original house, clad in anodized aluminum, features a live/work studio on the lower floor. Cool and stylish are the watchwords here. 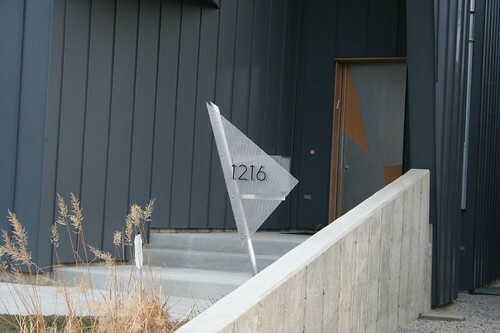 Little details reinforce the whole, such as the gravel sideyard separating the two houses, or the harmonizing house number sign. 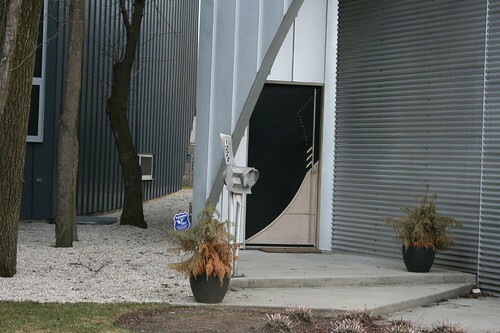 I certainly cannot claim to understand or even necessarily agree with the architectural philosophy behind such buildings (nor the erratic nonstandard punctuation, spelling and capitalization that architects are so in love with.) There’s definitely an impractical side to constructing things with lots of weird angles and random corners, and my first thought on seeing any such building is, does the roof leak? But it’s a seductive vision. 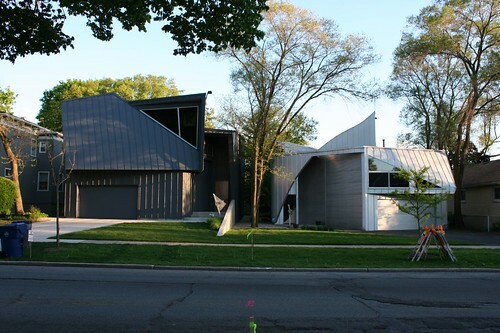 These houses are totally cool to look at and, I’d wager, equally cool to live in. According to the houses’ site, they incorporate numerous green design features, including passive solar heating and plenty of natural light. The interior photos show a series of absolutely lovely spaces. 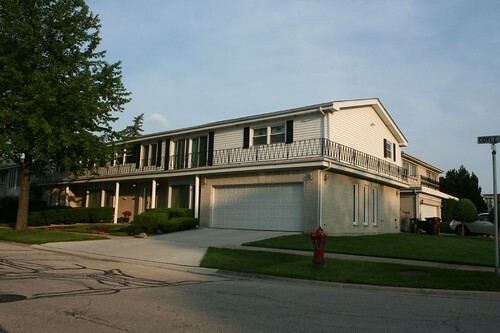 And at 25 years old, MetalHouse1 is looking great. 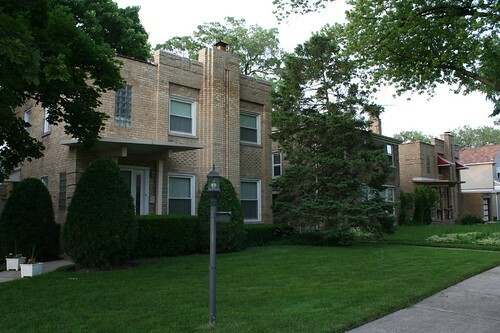 At the southwestern border of Skokie lies this peculiar little pocket of neighborhood. It is isolated by design, with several roads just not going through to the nearest artierials like Pratt and Niles Center. Thus, it’s a really easy little corner to miss. 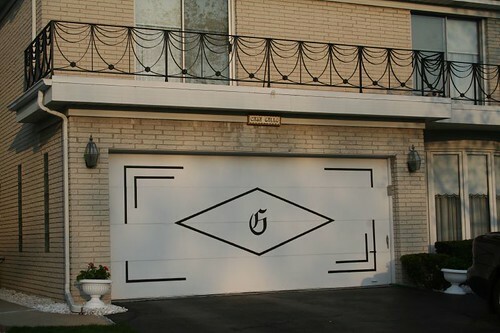 I’ve posted garage doors from this area before. 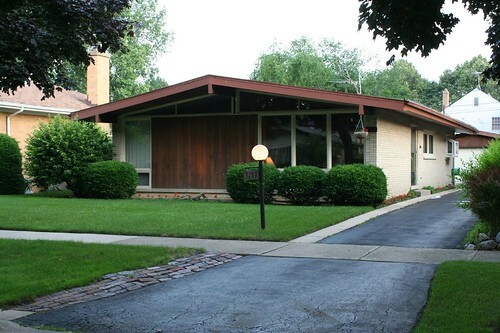 The neighborhood is home to some particularly idiosyncratic MidCentury ranch houses, the kind that can’t make up their mind whether they represent western frontier living, or Jackie Kennedy and Camelot fashion. They all went up in the mid- to late-1960s, hot on the heels of the 1964 creation of Coyle Park, now Norman Schack Park. 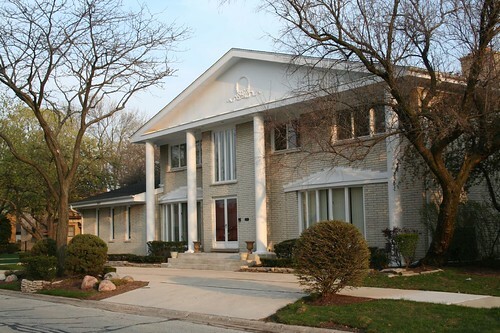 They were built by Shaf Home Builders (still in business today), though the Tribune archives are stubbornly unforthcoming about the company. Shaf offered home models that went by slighly outlandish names such as the “Cleopatra”, the “Queen Cleopatra” (the “ultimate in Colonial elegance”) and the “Casa del Encanto”, some of which were built here. 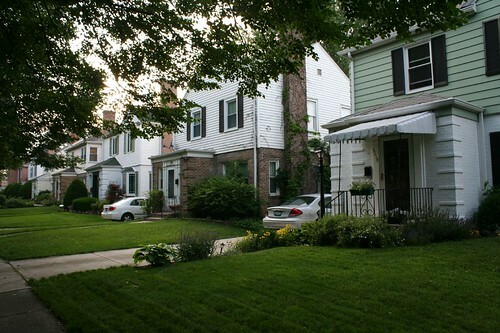 Those houses are the main attraction, or so I thought. 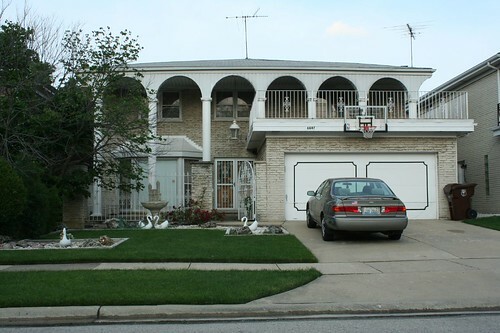 On a whim, I passed by a second time recently… and discovered just how odd are the houses in this little corner of southwest Skokie. 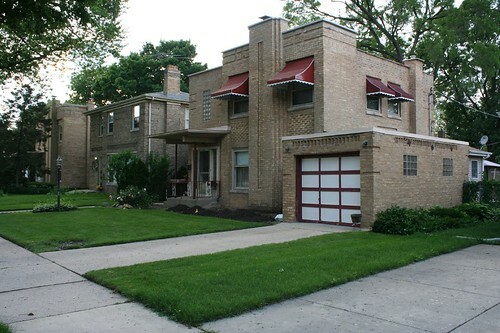 The big showstoppers are this trio of brick houses, with clear Art Deco influences. The tidy, compact footprint and the brickwork style both point to the inter-war years, and the hand of a professional architect. The Cook County database at CityNews, however, dates it to 1962. 1962?? This doesn’t look anything like 1962. BlockShopper.com dates the group to 1948, and another site says 1946, both of which make a lot more sense. The databases have the rest of the block as going up between 1940 and 1950. 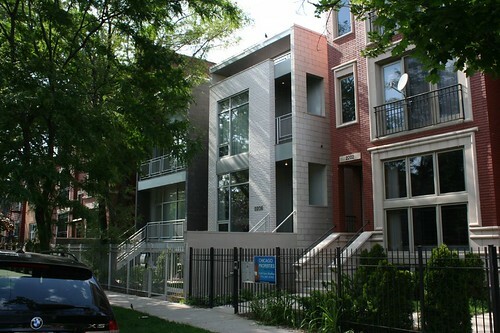 Those houses follow the same small-footprint plan, but only the first floor is sheathed in brick. Ranch house touches are added in. 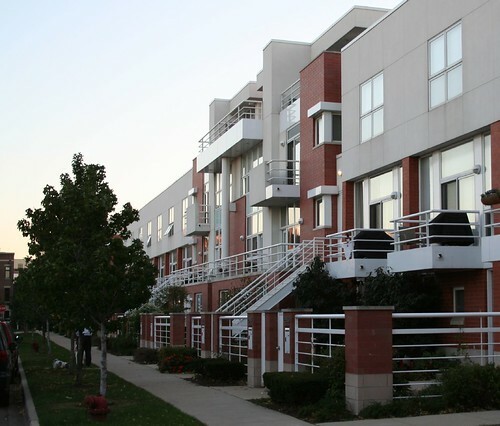 The separate mass of the entryway, and the raised brick stripes at the corners, peg the entire block to a single designer and make the buildings relate to their more high-minded neighbors on the corner. 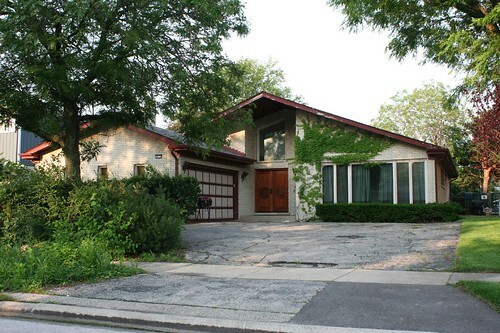 Then, a block north, amid some typical raised ranches, sits this lovely 1950s house. 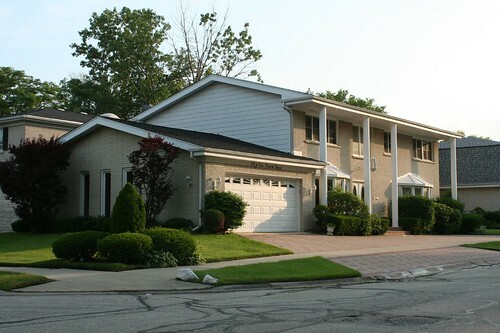 …which has a grown-up cousin amid all the Shaf Builders strangeness nearby. It’s a real box-of-chocolates neighborhood, well worth a repeat visit.